Street Art Tour of LA Street Art and the History of its evolution with Cartwheel Art Tours, Steve Grody, of Graffiti LA and Cornbread! 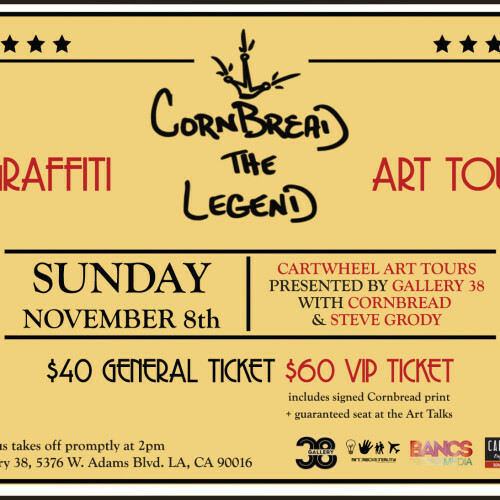 Join us for a very special Cartwheel Art Tours graffiti tour with Jim Prigoff, Steve Grody of Graffiti LA, presented by Gallery 38 and ArtAboveReality with Cornbread The Legend. It is on this tour where in addition to learning about graffiti lettering and styles from Steve Grody, historian and author of Graffiti LA, you will meet the first graffiti writer, Cornbread who will offer us the opportunity to learn about graffiti from his perspective, as well as experience his work as part of the tour at Gallery 38. The tour will begin at Gallery 38, where we will view some of the outside murals recently painted. From there we will hop on an air-conditioned bus, making stops at The Graff Labs and in the Downtown Los Angeles Arts District. The route will include viewing the work of graffiti artists in numerous yards such as, Saber and Zes. members of MSK/AWR Crew, K2S Crew, MDMN, Flore, The Producer BDB, Knowledge Bennett, Jaq Dutch, along with many others. In addition, special guest artist will describe their crew’s work while visiting their murals. We will end back at Gallery 38, where we will receive a special walk-thru of Cornbread’s exhibition which is Cornbread’s first exhibition. Check out the Gallery 38’s website to learn more about the exhibition here. Born 1953 in North Philadelphia as Daryl McCray, Cornbread used his troubled neighborhood and precocious personality as a springboard to become the youngest artist that stirred a worldwide movement: graffiti. Cornbread’s unflinching desire for recognition motivated him to utilize graffiti as expression. In contrast to tagging’s prior use as marking specific territory, Cornbread wrote his name all over Philadelphia to showcase no one neighborhood is enough for an artist. Steve Grody is the author of Graffiti LA: Street Styles and Art, historian, and speaker. Before Steve Grody earned his B.A. in fine arts, he was also involved in his era’s ‘pop’ graphics, psychedelic art. When he saw spray can murals popping up around Los Angeles’ walls, he immediately recognized their creativity and verve. Since 1990, he has been driving across L.A. and searching its back alleys, washes and abandoned lots in search of this vernacular art. Over the years he cultivated trust amongst L.A.’s most prolific, skilled and infamous graffiti ‘writers’ allowing him access to obscure locations, and through interviews clarified their motivations, and thoughts on creativity as well as the troublesome aspects of its illegality. His obsessive drive to document this distinctive youth underground has resulted in an archive of over 35,000 images. From this he has chosen the best work to illustrate the range of styles and approaches of this urban phenomenon in Graffiti L.A.: Street Styles and Art (Abrams 2007). In 2011 his photographs were in the MOCA “Art of the Streets” show and catalogue, and he was co-curator of “Street Cred: Graffiti Art from Concrete to Canvas” at the Pasadena Museum of California Art. You can see his TEDx talk on graffiti on Youtube. Gallery 38 is a beautiful creative space and art gallery located in the burgeoning art community of West Adams. The gallery is an ongoing project brought to you by ArtAboveReality and Bancs Media that brings together up and coming talent, some of which are represented by the gallery and pairs them in visually thematic exhibits that feature some of the most visible and sought after artists in and around Los Angeles and the world. The unique artist that light up the gallery daily differ in medium and composition, but are brought together by their unifying element of mixing mediums, street art aesthetics and thought provoking imagery. The Graff Lab is an urban sanctuary for artists, kids, and adults that opened after the Los Angeles public school district cut its after-school art programs in 2006. World famous for its graffiti and aerosol art, the Graff Lab is dedicated to providing artists with a safe space to develop their skills. At the Graff Lab artists don’t have to worry about getting harassed by the police or by gangsters; they are free to concentrate on their craft. But the Graff Lab is more than a public art space. The Graff Lab offers free tutoring and counseling in addition to free dance and music lessons (guitar and drums). The USC Boxing Club is in the process of setting up a training facility at the Graff Lab, so free boxing lessons are on the horizon as well. Top mural in The Graff Lab. Photo by Steve Grody. With support by Cartwheel Art Tours, Blick Art Materials on Beverly, U.S. Art Supply.